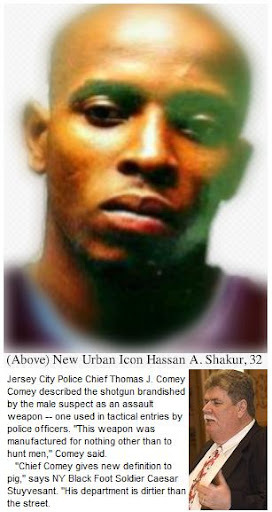 New York and New Jersey Black Foot Soldiers are calling Hassan A. Shakur (Hassian Hosendove) and Amanda Anderson “heroes who will receive their choice of virgins in heaven” after their fiery showdown with F.A.K.E New Jersey law enforcement officials: Jersey City Police Officer Michael Camacho, 25, Jersey City Police Officer Marc DiNardo, 37, Jersey City Police Officer Frank Molina, 35, Port Authority Police Officer Dennis Mitchell, 35, and Jersey City Police Detective Marc Lavelle, 43. “He wanted to go out in a blaze of glory, and unfortunately, he got what he wanted,” Jersey City Police Chief Thomas J. Comey said said. Foot Soldiers who reportedly witnessed Shakur & Anderson in action called their defense against the corrupt regime of officials a rare display of courage. 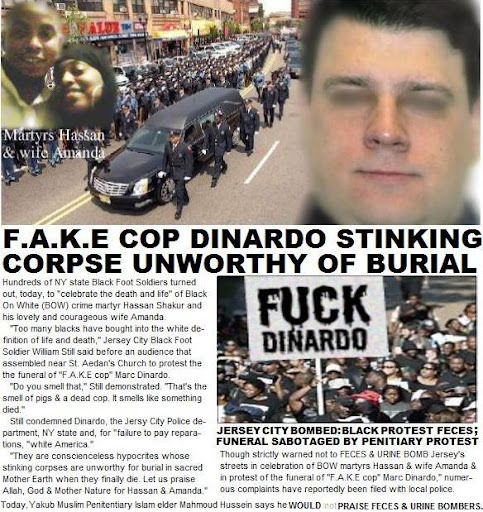 Stuyvesant praised Shakur and Anderson and ENCOURAGED SOLDIERS STATEWIDE not TO LITTER THE STREETS WITH NEWSPAPER PHOTOS SMEARED WITH FECES OF THE SO CALLED OFFICERS.